Stay at the coolest downtown hotel in Vegas. Packed with entertainment for the whole family and a view not to be reckoned with! Save up to 30% off with this deal. Stratosphere is a 24 story hotel with a 100 floor tower located at the northern end of the Las Vegas Strip. You can see it from everywhere on the strip and it offers the most spectacular view of Las Vegas. If being up that high wasn’t thrilling enough, they have thrill rides on top of the tower. The hotel offers a full service salon and spa, casual and fine dining, a large action packed casino, entertainment, and unbeatable views. The Stratosphere Casino Hotel and Tower is a soaring 1,149 feet tall and has the most stunning views of the Las Vegas strip. 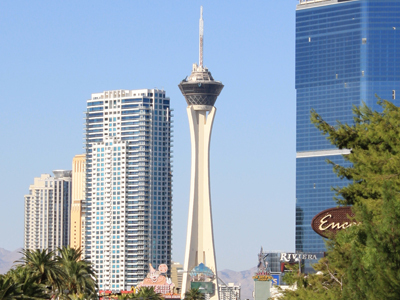 The tallest structure in Las Vegas on the northern end of the strip is not only known for its views, but they have thrill rides on top of the tower to soar you through the stratosphere. There are 4 thrill rides that propel you high in the air, spin you out over the edge of the tower, and plunge you over the side of the tower. This is a thrill seekers dream. 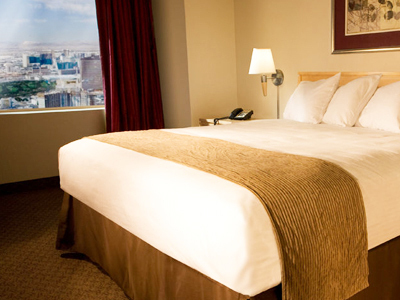 The accommodations at the Stratosphere are newly updated with a contemporary sleek design and modern amenities. The flat-screen TV, iPod dock and luxurious bedding will have you feeling right at home. The spacious bathrooms are well appointed. There is plenty of excitement at the hotel. 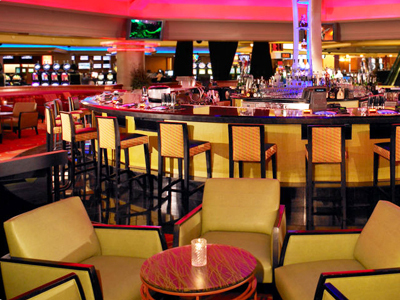 The large casino will have you feeling like a winner with its exciting atmosphere. The entertainment is fun-filled with live music, a nightclub to dance the night away, and the lounges provide for an intimate cocktail. The hotel has plenty of activities for your enjoyment. The full service salon, spa and fitness center will keep you relaxed and feeling your best. The pool area is a relaxing oasis in the desert with fabulous views. The assortment of dining options will please everyone with everything from gourmet fine dining, an enormous buffet, casual fun dining and quick eats. The Stratosphere is an exciting destination with awe-inspiring views. For the best views, visit the Tower Observation Deck and, for the not so faint of heart, the rides atop the Tower. Spa/Salon: Focused on treating the body and soul, the spa at the Stratosphere is the renowned Roni Josef Spa. The spa features treatments rooted in ancient and alternative therapies for skin and body care. They offer a wide variety of massages including holistic massages. Pamper yourself with one of their unique facials or body treatments. This full service salon at the spa will have you looking your best. Pool: The Elation Pool is located on the 8th floor of the tower and is an oasis in the desert. The large uniquely shaped pool is surrounded by a spacious 67,000 sq. ft. sundeck. Sit back and relax in one of the comfortable lounge chairs and take in the beautiful views. A poolside bar and café will keep you satisfied. Cabanas are available for rent for those wanting to get away from it all. The Rooftop Pool is on the 25th Floor and is for guests 21 and over. It is open seasonally until 11 pm and offers a Sunset Happy Hour. Shopping: The Tower Shops are located on the 2nd floor of the tower and have 32 different shops offering, apparel, souvenirs, gift items and toys. 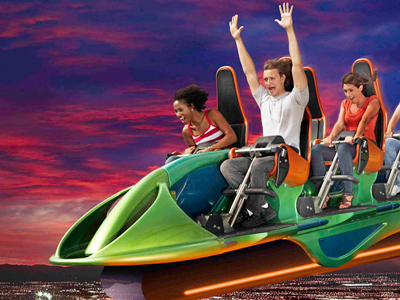 Thrills, action and adventure are all rolled into one exciting ride. The Big Shot will have you screaming for more! The thrill of shooting up the tower and then plummeting back down is just plain awesome. Get ready for a seriously insane adventure. Spin at 3G's, 64 feet away from the edge of the Stratosphere Hotel-Casino. Look down and you will see your feet dangling above the Las Vegas strip. SkyJump at the Stratosphere Tower in Las Vegas is the only ride of it’s kind in North America. Experience a controlled free fall from 108 stories up as you step off the starting platform and “zip” down to the landing pad 855 feet below. Situated 100 stories above the Las Vegas strip, you will enjoy unrivaled views of the Las Vegas fabulous skyline. The tower is also home to four thrilling rides: Insanity, Big Shot, SkyJump and X-Scream. This is a must-see attraction for everyone. On the X-Scream, it is totally acceptable to scream your head off. In fact, it just might be unavoidable! The Stratosphere Casino, Hotel and Towers offers the exhilaration you have been looking for with its exciting gravity-defying X-Scream attraction. The newest immersive experience on the Las Vegas Strip, Celestia presents a story of love and sacrifice told through acrobatics and other feats. Fans of Cirque shows are sure to love this family-friendly show. We have stayed here 4 times now. On one occasion, the concierge upgraded our room for simply having a nice conversation with him. On another occasion, they helped us with a room when the Luxor screwed us with our reservation. A great hotel to stay. Quiet and the tower restaurant is amazing. The location is pretty far from the main strip which was disappointing. We wanted to be right in the middle of the action. The view was nice and the room was up to date. Go to the top of the tower, you’ll never see a view that amazing. We would probably try and find something a little nicer for our next stay. The Stratosphere is so cool! You can go up to the top when you stay, and its super fun. The rooms were ok. You really save money staying here, and have a blast. It was my second time here and I know I will be back! You get a fridge in this and the room was decently priced. We had a great view, a large TV, and a large comfortable bed. Check-in was a breeze with an added bonus of a free room upgrade. The top of the tower is a must see though, the view from the top is breathtaking day or night! This used to be the only hotel we would stay at. For the price it’s a great place, just don’t try to pay for your room with cash only. Most of the front desk staff do no know how to handle a cash only transaction and you will have to wait forever for a manager to come help them.the check in line is always a long wait. the casino staff are nice. I would recommend this hotel for the first time visitor because of the price, and The rooms are clean. Close to Old and New Vegas. We recently stayed in the Towers. Our room was remodeled and it was decent. The view was fantastic! We faced the strip. We liked we could go to the top for free since we were a guest of the hotel. We liked the location because it is close to Old Vegas. We prefer the old casinos. The location is at the North End of the Strip. It is far away from the main strip. There were lots of homeless people in the area, so it didn’t feel the safest situation for us. The bus was easy to use. Our first room was old, strong odor and just beat up. We requested a new room, and it was much better. The food was decent, nothing to rave about. The best part was the view from the top.